In urban studies, the nineteenth century is the "age of great cities." In feminist studies, it is the era of the separate domestic sphere. But what of the city's homes? In the course of answering this question, Apartment Stories provides a singular and radically new framework for understanding the urban and the domestic. Turning to an element of the cityscape that is thoroughly familiar yet frequently overlooked, Sharon Marcus argues that the apartment house embodied the intersections of city and home, public and private, and masculine and feminine spheres. Moving deftly from novels to architectural treatises, legal debates, and popular urban observation, Marcus compares the representation of the apartment house in Paris and London. 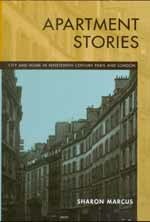 Along the way, she excavates the urban ghost tales that encoded Londoners' ambivalence about city dwellings; contends that Haussmannization enclosed Paris in a new regime of privacy; and locates a female counterpart to the flâneur and the omniscient realist narrator—the portière who supervised the apartment building. Sharon Marcus is Associate Professor of English at the University of California, Berkeley.